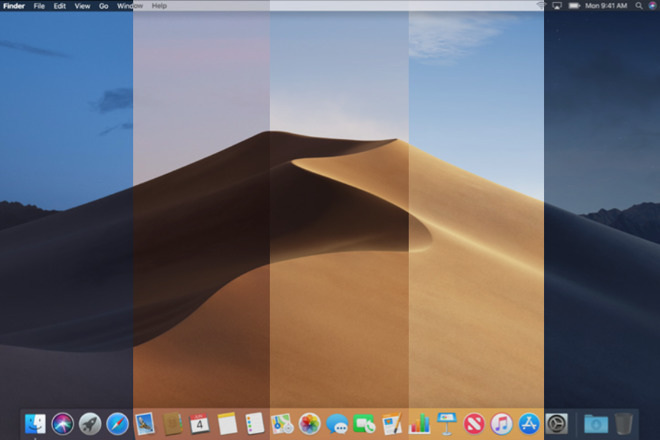 One day following the public release of macOS Mojave, Apple on Tuesday issued a beta of the operating system's first point update to developers for testing. Now available to download through Apple's developer website, the first macOS 10.14.1 beta, carrying a build number of 18B45d, appears to be a minor update to the just launched Mac operating system. Apple has yet to provide release notes for the software, though previous beta release patterns suggest version 10.14.1 will contain bug fixes and general performance improvements. Also on the table is support for Group FaceTime, a marquee feature initially scheduled to launch with iOS 12 and macOS Mojave 10.14 this month, but was stripped from iOS betas in August. Demonstrated at the Worldwide Developers Conference in June, Group FaceTime allows 32 users to join a single video conference call on their iOS or macOS devices. In release notes to developers last month, Apple failed to disclose a release timeline for the video calling function, saying only that it was expected to debut later this fall. The feature returned to the beta track with iOS 12.1 last week, pointing to a near future launch. Apple's latest macOS Mojave beta also includes a revamped download management system. Following an initial download via the macOS Developer Beta Access Utility, developers can install new releases from the Software Updates panel in System Preferences as new builds become available.